I’d been running through the dense vegetation of an Aspen forest without much sign of life for almost an hour now. Tufts of matted grass trail-side occasionally grabbed my foot threatening to take me down. I try calculating how long until I’m out of the woods through a carbohydrate depletion mind fog. I figure another ten minutes. Suddenly something large starts crashing through the brush towards me. It’s black, it’s big, it stands up… I brace for the worst… a blond pony tail whips through the air. Thank goodness! It’s a woman in black Spandex picking mushrooms and not a bear! A couple minutes later and I’m behind the finish line of the Moose Mountain Marathon eating homemade soup and scraping the dried remains of an energy gel from my shirt, shorts, and legs. The Moose Mountain Marathon in Kananaskis Country starts and finishes in the West Bragg recreational area (45 minutes outside Calgary Alberta). Close to 150 runners participate in the three distances (16km, 29km, and 42km). The 16km (10mi) course is the most popular distance and also the least scenic. The 16km route takes you through the Aspen forest of the Telephone Trail where you spend most of your time looking at your feet, dodging mud holes, climbing through cattle fences, and being frightened by Spandex wearing mushroom pickers. The 29km (18mi) is the most scenic, it’s basically one big hill race with a 1000m (3200ft) gain / loss. The 29km route takes you along the Moose Road Trail, Moose Packers Trail, to Moose Mountain Trail, and then back. At about the 10km mark you break through the tree line and continue to run the next 8km surrounded by spectacular panoramic views. The 42km (26mi) option combines the 29km route and most of the 16km route. The elevation gain for the 42km distance is somewhere in the ballpark of 1700m (5500ft), the highest point around 2300m (7500ft), and the actual distance closer to 40km than 42km. It’s a great course and event. I will definitely run it again. My race plan going into this event was progressively conservative – in the Powderface 42 I targeting an 80% max heart rate, this time I targeted a marginally higher rate of 83%. Things went well, I took the climbs at my own pace, worked through a couple side stitches in the first half, and legs felt good on the descents (likely the results of weekly trail running). Coming through the 27km aid station I was told that the guy ahead of me had a 5 minute lead. So.. I took my time, ate some party mix (there’s nothing better than cheezies and chips on the run), had a couple drinks, took a quick pit stop in the woods, then back on the trail. The final portion of the run was through the overgrown Telephone Trail where it’s hard to look at anything but your feet – let alone know if someone or something is closing in on you. After crossing the finish line I was surprised to learn that I had narrowed the gap to 70 seconds. If I had known we were that close I would’ve run harder! I finished with my 83% goal. Here’s my track. Chunks of skin falling from my sock while changing shoes is never good. Especially considering my shoes (La Sportiva Crosslite’s) blew their sides out during the Powderface 42 trail run – resulting in my toes jamming into the front of my right shoe for the last 30 minutes. I was happy to discover the skin originated from an old dislodged blister and that the feet were generally OK (the toenails might be casualties), but the shoes certainly did not survive (my shoe review). The Powderface 42 is a 42km (26mi) somethingish trail run through Alberta’s beautiful Kananaskis Country – this year due to a bear the course took a detour and was a bit longer. The terrain on this route is fairly challenging and the aid stations are few and far between. I’d never run anything of this distance or with this elevation profile. Needless to say, I did have apprehensions going into this event. The terrain was definitely one concern, but my biggest concern was my lack of long runs. I hadn’t run anything beyond 30km since May 6th (my Vancouver Marathon DNF) and my longest run in the past month had been 25km on June 24th (Rundle’s Revenge). I felt undertrained which reflected my race plan. The plan was to adhere to a strict 75% – 80% heart rate (HR) range to conserve energy for the last half of the course where I anticipated slowing down. 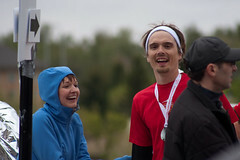 At 7:00am with overcast skies and temperatures around 15C (59F), friendly familiar faces surrounded the starting line. These trail events are small, typically capped at 150 participants. In this event the runners were spread between two distances, with 50 runners toeing the longer distance. 7:30 hits and the gun sounded, off we race into the trees. For the first 5km my HR was pushing above 80% likely a combination of too much coffee, nervs, and excitement. I chatted with some runners, but soon found myself alone focusing on the trail and foot placement. 11km into the run and the 6km climb up to the pass (500m elevation) began. I was feeling strong and made headway on my position while keeping a close eye on my heart rate. Down the other side on the steeper runnable descents I’d catch myself zoning out (road runner style) or rather my foot would catch a root and send me flying off trail – reminding me to remain alert and how quickly my run could end. At the 25km aid station I was still feeling good, but knew it was early and that anything could still go wrong. Another 10km of fairly sustained downhill and I was still felling OK although a couple minor calf cramps paid a visit and there was a good chance that more were in the mail. Some more climbing and no sign of cramps, things were looking good. 4km from the finish and the cramps began. Boy were they annoying. I worked through them by altering my cadence, running slightly sideways (zig-zagging back and forth on the trail), and running them out on the flats. After 44kms (27mi) in total I was happy to cross the finish line and surprised that I maintained an 80% average heart rate without slowing in the last half of the run. This long distance trail running business is interesting. Events of this nature combine obstacle course traversal with a keen sense of self monitoring – a need to gauge energy reserves and anticipate nutrition / hydration needs as the distances between aid stations are fairly long. I found it interesting that while I hadn’t been logging many long runs my long (4+hrs) mountain bike rides compensated quite nicely. In future trail races I’ll need to run through the creeks and mud holes. I wasted a fair amount of time trying to keep my feet dry, but then again I was getting blisters with wet feet (in my now trashed shoes). I’m hoping that new shoes might make wet feet running more enjoyable. Next event I’ll try targeting a higher heart rate range too. Here’s my track. My taper for the Vancouver Marathon (May 1st) started this week. Over this training session (Jan 1st – April 21st) I’ve logged 750km (466mi) in 60 some hours, gone through two pair of shoes, burned through 60,000 calories, and discovered the joys of running outside. Yes, in the COLD! The coldest day being -28C (-18F). I used to be a fair weather enthusiast, pulling out any excuse to stay indoors in less than ideal conditions, but after breaking my treadmill I discovered that I’m quite weather resistant. Running outside through the winter was fun. Every run was a chance to flip winter the bird, an excuse to wear shorts (well… usually), and each step brought the warm weather closer. Sure there were a couple tough days, but adversity builds character. Right? 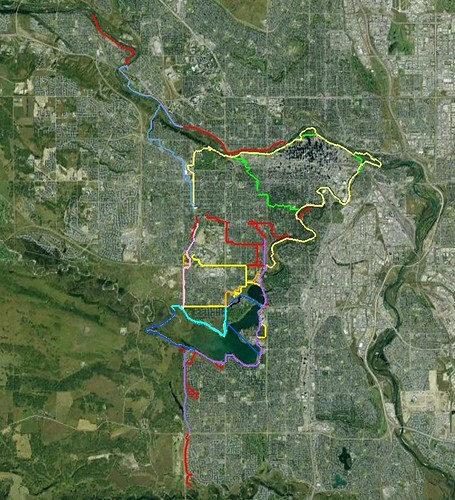 This image is an overlay of my long runs in Calgary since January 1st. Did you know that, the fastest time for the 2010 Calgary Marathon was 2:32, the fastest time for the 2010 Vancouver Marathon was 2:16, the 2012 Olympic Qualifying Standard for the Marathon is 2:15 – 2:18, and that the world’s fastest marathon (2:03) was run this year at the Boston Marathon. I love summer, every moment of it! 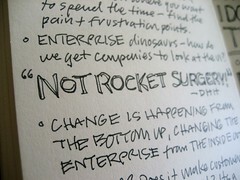 It’s difficult to write a blog post or even digest tech content in the precious summer months. Biking. I was able to get lots of mountain biking in. Although the conditions were usually wet and the trails muddy, I was still able to get out on the bike twice a week. Besides, according to my philosophy, the amount of mud you take home on your bike is directly proportionate to the amount of fun you’ve had. No mud, no fun. Although most my friends would disagree. :) I also picked up a bike for Steph at the end of this summer and we toured some of the easier albeit LONG rides (Elbow Loop, Goat Creek to Banff Springs to Canmore to Goat Creek). Hiking and Backpacking. We managed to knock of a couple local hikes: Mount Baldy (photos), Mount Lawrence Grassi (photos), Moose Mountain (photos), Black Prince Lake (photos), Prairie Mountain (photos), Stanley Glacier (photos) along with a backpack trip to Floe Lake (photos) and another to Forks and Turbine Canyon (photos). Europe. I FINALY got to Europe, something I’ve been wanting to do for a long-long time. Europe lived up to my expectations, we visited France (photos), Italy (photos), Vatican City, Holland, Belgium (photos), and England (photos). My favourite country while in Europe was Italy. Italy was more exciting, crazy, dirty, and entrepreneurial than the other countries, but Thailand is still my favourite country. I’m dying to go back to Southeast Asia. Running. When I wasn’t biking, or hiking, I’d fall back on my trusty shoes, and you can bet I was running while in Europe. Running was an amazing way to experience a city. My favourite run was in Paris (running from Notre Dame, through the the Louvre gardens, to the Arc de Triomphe, under the Eiffel Tower, then back to Notre Dame). I want to do the Paris Marathon next year. I also ran the parameter of Lamballe France, through the rural country side and down a river near Guipry France (South of Rennes), the circumference of Venice Italy (I got horribly lost), through the hill paths between Manarola and Riomaggiore Italy (an hour long hill workout in the heat), a 12km session on a Belgium treadmill (yawn), and around the Royal Gardens of England (pretty). Yeah… I admit I am borderline obsessed with running. At the 32km marker a series of signs were staked into the grass along the course. The first sign read “You’re doing it!”, the next “Only 10 more kms!”, and the next “You’re running a marathon! You ARE a marathon runner!” A tear welled in the corner of my eye, perhaps from the pain in my quads, or the reality of still being 10km from the finish, but more likely because it finally dawned on me that I was indeed running a marathon – an event I’d been looking forward to since running the Half Marathon a year earlier. Training for a Marathon was relativity easy. Basically you run one long run every week, in addition to running 6-10km 4 times every week, then rinse and repeat for 3 months. As boring as that may sound, once I got into a routine, and found a running partner, I looked forward to running. Here’s the schedule I followed (I know, I know, don’t laugh, it’s from the far from reputable About.com): Basic Marathon Training Schedule for Beginners. My next goal is to qualify for a Boston Marathon (qualifying time is 3 hours, 10 minutes, and 59 seconds). I’m not too far off the qualifying time, as I managed to finish Calgary in 3:22. I ran my first half marathon this past weekend. Finding training resources online was difficult so I’m passing the tips that I found useful. Running with 3000+ people for the first 16 kms was an amazing experience, after the 18 km mark I was questioning my sanity, and when it was over all the race participants were on top of the world. I highly recommend doing a half or full marathon. I raised some money for Team Diabetes and managed to finished in 1:58. Next year I’m planning to run the full marathon. 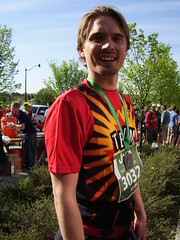 I’m running the half marathon for diabetes in Calgary on May 31st . This cause has a personal connection – one of my younger siblings has diabetes. My training up to this point has been terribly lax, I’ve been running 7km in about an hour. At this pace it’ll take at least 3 hours to break 20kms – Ouch! Steph (my wife) and I had been toying with the idea of getting a dog, we've been looking at different breeds, visiting shelters, and emailing breeders – I have to give Steph all the credit, she did most of the research. Anyhow, we came across a post on our Kijiji for a mature Soft Coated Wheaten Terrier. Now we have a dog. Being a Geek and all, I wasn't sure if I was a dog (or cat person), but Belle is a great dog. Her constant need for a walks is a great reminder to take a micro break while working from home.